The highlight of this page will be the new raid faction, folks - the Avengers of Hyjal. Designed to work similarly to the The Ashen Verdict of Wrath of the Lich King, the Avengers will offer cloaks, belts, trinkets, and rings of item level 378 (equivalent to Firelands Normal) to players with sufficient reputation with them. The other two features orphaned here is the new "map" animation your character will perform whenever you open an ingame map or mailbox, which while nice is not enough to steal the spotlight from the new faction; and then there are some new maps - one for the Molten Front dailies area, three for the Firelands raid, and one for the instanced version of the Nexus available only to players on Through a Glass, Darkly, part of the Dragonwrath quest chain. Aptly named, the Avengers of Hyjal are a new faction associated with the Firelands raid instance in a manner similar to how The Ashen Verdict was a recurring theme inside the Icecrown Citadel. Technically made up of members from the Cenarion Circle, the Avengers seem to be a little more aggressive than your average nature-loving and forgiving druid. Angered by Ragnaros' invasion, those angry birds druids have decided to take the fight to the Firelord's doorstep, even moreso than what Malfurion and friends are doing in the Molten Front. Reputation gains for the Avengers of Hyjal are, not surprisingly, similar to the ones for the Ashen Verdict. Trash monsters will award reputation based on their difficulty, and bosses will offer nice big chunks that feel really warm and fuzzy. It is possible that Ragnaros will grant you even more reputation than the other bosses, but that is an unconfirmed speculation for now. This feature has cropped up on the 4.1 PTR, but was removed before the patch release. Now it has appeared on the 4.2 PTR, so let's hope it's really in this time. This nifty roleplaying feature lets your character do an animation. When opening the map or a mailbox, your character performs an animation that resembles the action you are doing. For example, your avatar pulls out a map and scans through it. Closing the pane makes the character roll up the map. This is a slightly modified map of The Nexus and you get to see it only if you are on the appropriate quest from the questline to obtain Dragonwrath, Tarecgosa's Rest. This is the new daily quests hub (and a new zone!) 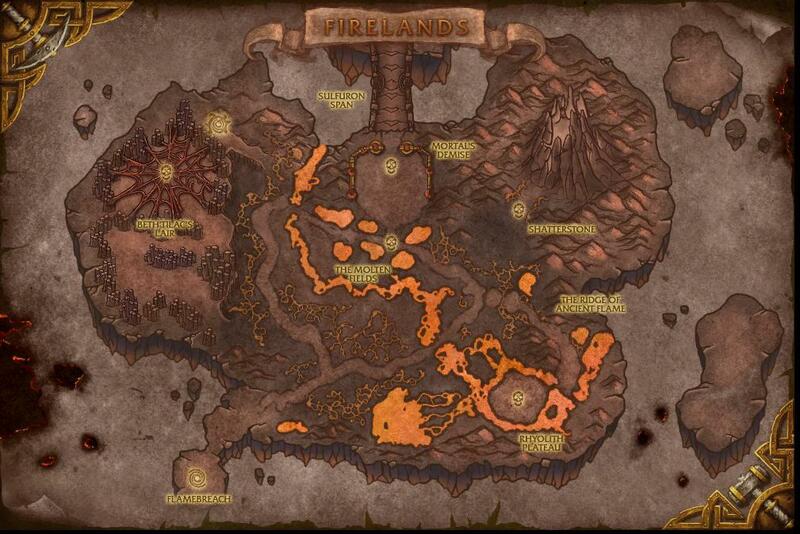 located in the Firelands. 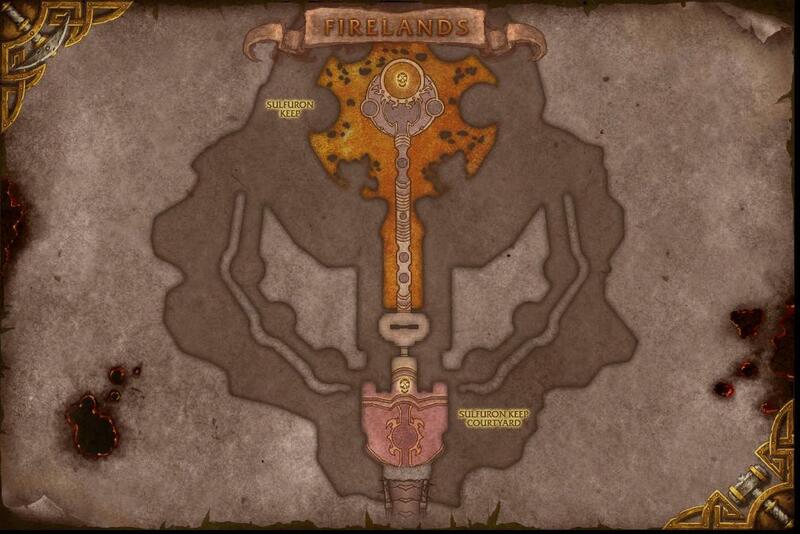 Players start on the little peninsula on the south side of the map, where the label "Malfurion's Breach" cheerfully defies Ragnaros' wrath. 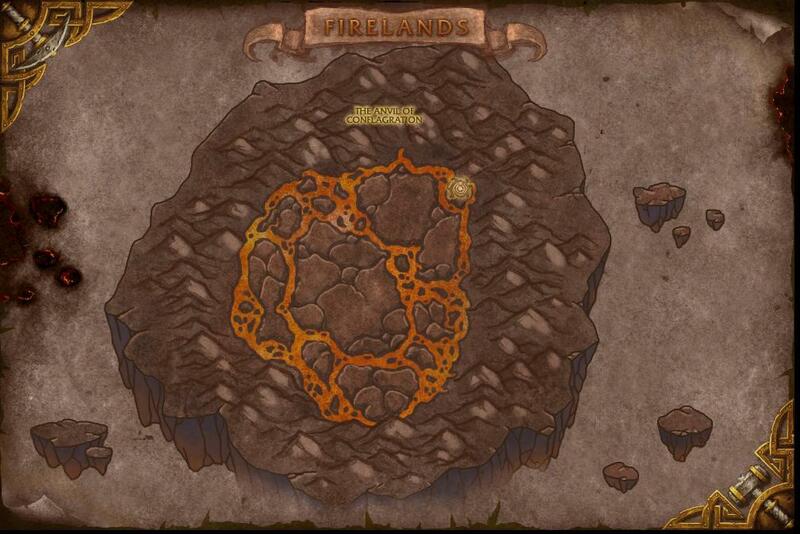 And here are the maps for the three levels of the Firelands raid. 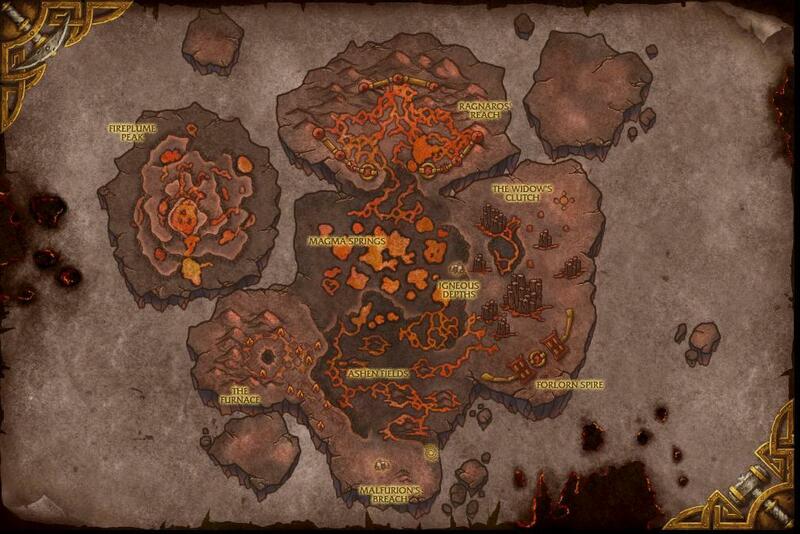 The last map shows the very heart of Ragnaros' power, the Sulfuron Keep.